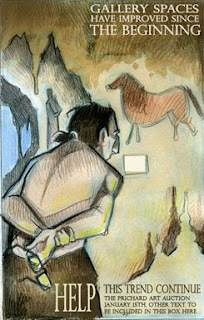 A concept for the art auction poster was chosen: the caveman. I tried to nudge them toward the Napoleon concept, but they were firm. I think it's for the best, at any rate. The Napoleon concept (a parody of an iconic David painting), while snigger-worthy (in my opinion, anyway) didn't leave much room for creative license in the imagery. After all, what could I possibly add to a Jacques Louis-David painting other than an auction paddle to improve it? I spent some time yesterday playing around with various layouts and compositions and have decided on this one. The text layout is likely to change slightly, but I think this positioning of the various elements provides the best vehicle for the information and the visual elements.